Coronary artery disease (CAD) is a major issue which is on the rise across people of all ages and walks of life. People with coronary artery disease suffer from frequent recurrent Angina. Angina is a term used to refer to the symptoms associated with coronary artery disease due to the insufficient blood supply to the heart. Angina is experienced when the vessels carrying blood to the heart becomes dysfunctional due to blockage or narrowing. The symptoms of angina are different for each person. Some of the common symptoms are chest pain, fatigue, shortness of breath, pain in the arms, neck, jaw, nausea etc. People generally assume that a surgical procedure like Bypass or Angioplasty is the only cure. ESMR is here to change that. ESMR stands for Extracorporeal Shockwave Myocardial Revascularisation. It is a non-invasive and safe alternative procedure which supports Myocardial Revascularisation i.e. improving the blood supply to the heart muscles. ESMR is a great treatment alternative for people who cannot or do not want to go under the knife. ESMR non-surgically improves the supply of oxygenated blood to the affected portion of the heart. ESMR is also known as Non-Invasive Cardiac Angiogenesis Therapy. ESMR is a non-invasive shockwave therapy targeted to the ischemic myocardium (affected) zone inducing angiogenesis in order to improve the myocardial revascularization. A cardiac ultrasound is used to locate the affected area and map the exact position and extent of the ischemic zone. Shock waves are special acoustic waves generated by an underwater high voltage spark. It is delivered to the patient non-invasively by focussing on the affected area using an ellipsoid reflector. The patient may feel a tickling sensation in the treatment area. The reflector is attached to the patient’s skin near the affected area with a water cushion. The focal zone is adjusted based on the treatment requirement. The sound waves exert mechanical tension and pressure on the affected tissue causing stress on the vessel wall. This, in turn, stimulates the process of angiogenesis. Each treatment session takes about 20-30 minutes. The number of sittings for treatment is recommended based on the extent of damage to obtain optimal results. Who can undergo ESMR Treatment? Neomed hospital is a pioneer in integrated regenerative medicine helping lakhs of people to avoid surgery through a non-invasive approach. 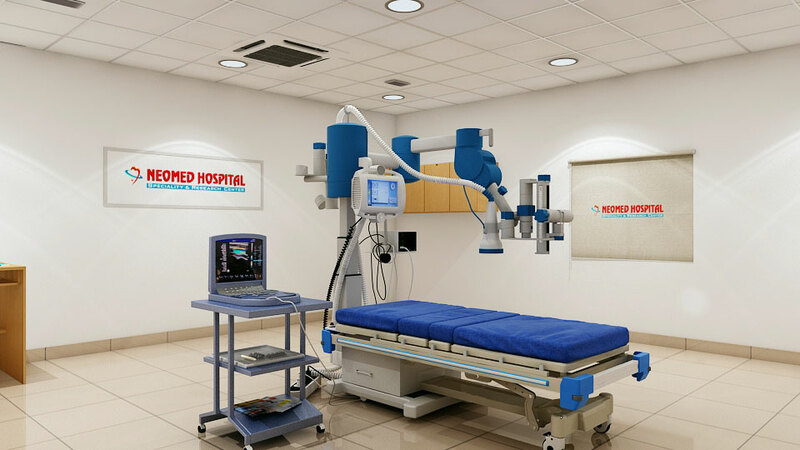 With a dedicated team of doctors headed by Dr. Sivabalan, with over 25 years of experience in the field, Neomed hospital is the best heart hospital in Chennai for ESMR treatment in Chennai. Neomed hospital is the pioneer for ESMR treatment in Chennai with an expert team of doctors ready to address all your medical needs.